Ideal for long trips, half of the roomy interior features a large zippered compartment. Also included is a removable garment bag and built in TSA locks. Although the suitcase is hard, it’s pretty lightweight. I find it easy to wheel and have never had any issues with the handle. However, despite the rubber bumpers it can get pretty scratched up. 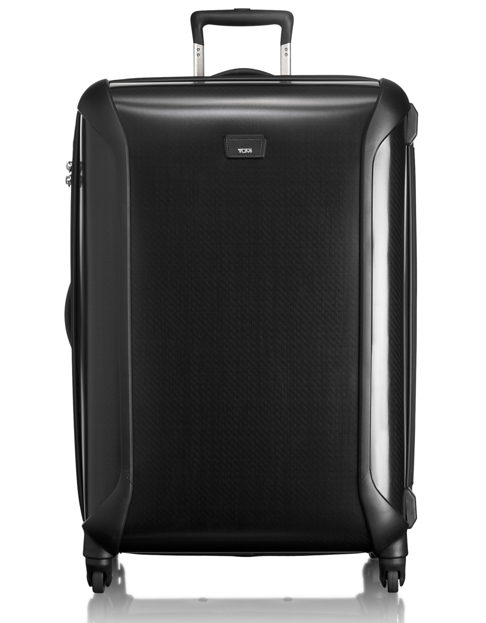 Head to a Tumi outlet to get this for half the price! If you are looking for a soft suitcase, American Tourister is your best option. This is both sturdy and large, I use mine during international travel. Since it’s so lightweight, you can bring even more stuff home! 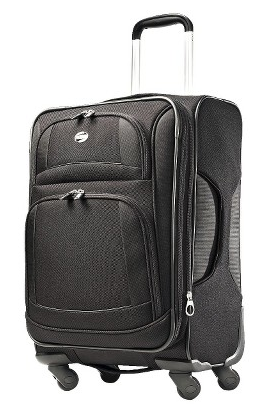 Thankfully, American Tourister has finally added spinner wheels so that trekking through the airport is even easier. 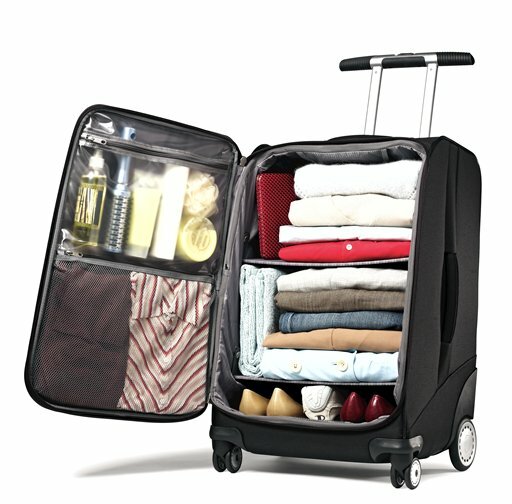 This suitcase features a convenient mesh pocket (perfect for undergarments) and a front zip pocket. You can buy one of your own for an affordable price at Target. 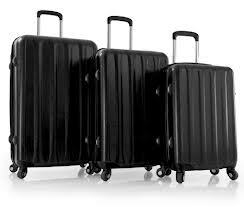 My favourite roller carry ons have all been Samsonite. The new EZ Cart was recently featured on the Ellen Show, so you know it’s good! It includes a balanced four wheel system and a new shelf packing style, so you can live right out of the suitcase. The flat top makes it perfect for stacking additional bags on top. I personally want to buy this version in the future, right now I use a similar suitcase that’s accented with snakeskin. I found mine at Marshalls! I made this splurge a few years ago and it was certainly worth it. This bag goes with me on the plane, in the car and to many sleepovers. I use it to pack one full outfit, all of my shoes, jewelry, sunglasses, winter accessories and all of my tech chargers. Even with all of that there’s still space! I use that for souvenirs. 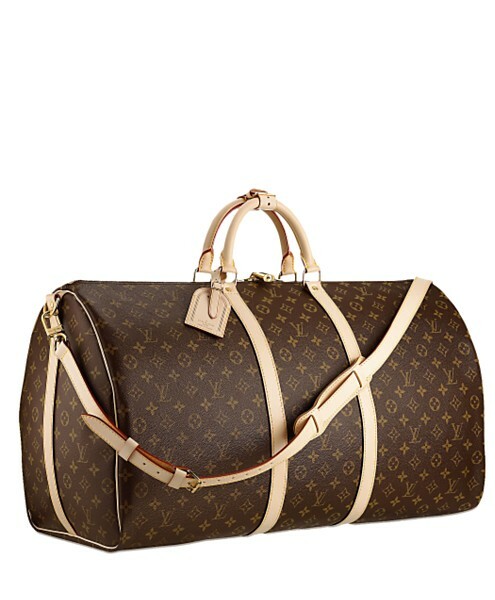 The iconic monogram canvas, rounded leather handles and double zipper make this the perfect luxurious travel accessory. If you buy it in the store they will personalize the luggage tags with your initials. It’s a really beautiful touch. The next time I need to buy a hardside luggage set, I’m turning to Heys. After seeing how well my roommate’s collection has done through international travel, I’m sold. Not even a single scratch! I think that’s because the unique shell which has a weave surface pattern. It’s lightweight and has convenient pockets inside. These beauties can be hard to find, but you can try The Bay. Tags: American Tourister, American Tourister DeLite Spinner, American Tourister DeLite Spinner reviews, best luggage, best suitcase, Ellen Show, Ellen Show giveaways, Heys, Heys luggage, Louis Vuitton, Louis Vuitton Monogram Canvas Keepall 60, Louis Vuitton Monogram Canvas Keepall 60 reviews, luxury travel, Marshalls, Samsonite, Samsonite EZ Cart, Samsonite EZ Cart reviews, target, the bay, The Ellen Show, top 5 Friday, top 5 luggage, top 5 suitcases, travel in luxury, travel reviews, travel tips, Tumi, Tumi outlet, Tumi Tegra Lite Large Packing Case, Tumi Tegra Lite Large Packing Case reviews, what fits in louis vuitton keepall 60. Bookmark the permalink. OMG that Samsonite suitcase?! I am in love! I bought the American Tourister DeLite Spinner (in purple!) on Friday and I’m pretty excited to try it out in the next few weeks – I’ll let you know how it holds up! Yes, please do! I absolutely need the Samsonite suitcase, it’s my dream. I practically live out of suitcases as it is now, why not make it easier? I loved this post obviously! & I agree with you, I really want the Samsonite suitcase! Absolutely perfect for organization!